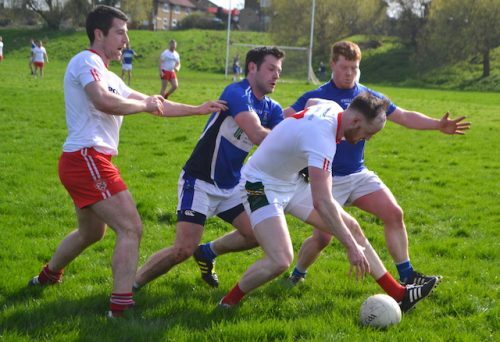 Championships aren’t won in April but this was an impressive early season showing from Tir Chonaill Gaels all the same, as Paul Coggins made a winning return as senior team manager of the Greenford outfit. 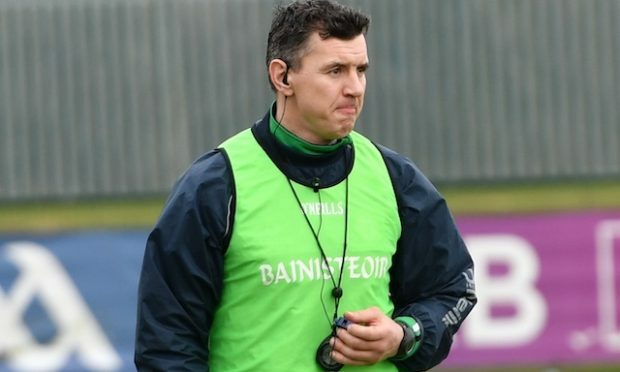 Having won four senior titles as Gaels boss before departing to take London to new heights, Coggins is back in the hot-seat and eyeing a fifth senior championship on his watch. 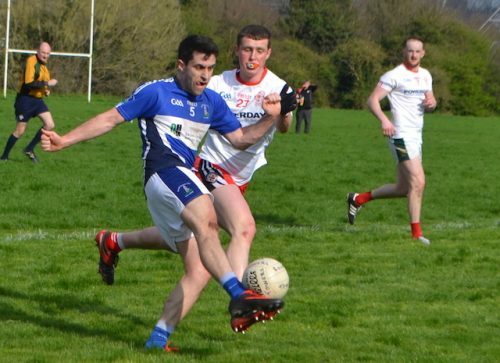 On this evidence – minus a host of their inter-county stars – it will be a huge surprise if Tir Chonaill are not once again in the mix come the final shake-up. Adrian Hanlon showed just why he was once part of Donegal’s senior set-up as he bagged 3-10, as well as turning provider to set-up Brian Mullin for the visitors’ other goal. 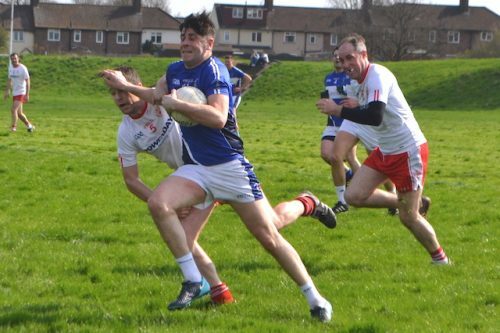 Hanlon, though, had competition from Round Towers’ Ronan Boyle for the mantle of the afternoon’s star performer, as the former Kingdom Kerry Gaels’ man racked up 2-6 – an impressive tally in a losing cause. It was Boyle who inspired the south Londoners to a flying start. Indeed, few could have predicted the final scoreline based on the evidence of the opening nine minutes as Towers led 0-3 to 0-1. And they were good value for that lead, playing some delightful stuff. All of the home side’s scores came from Boyle. Paul O’Donogue’s beautiful crossfield ball led to his opener. His second was all his own work, while Liam Feerick, O’Donoghue and Tomas Hill combined to set up Boyle’s third. 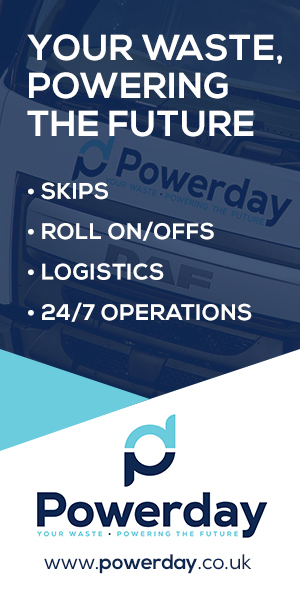 It was that Feerick, O’Donoghue and Hill axis which laid the foundation for the Towers’ bright start. 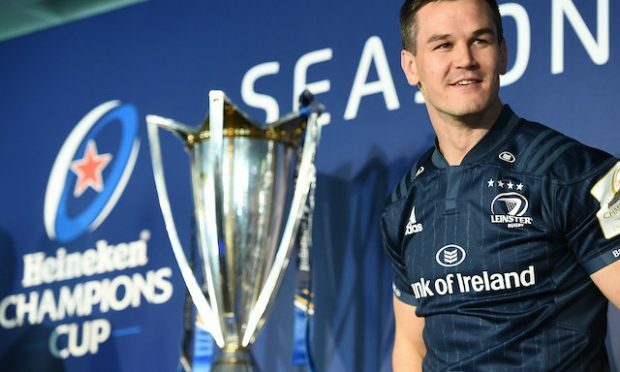 Hill, playing in a deeper role, helped his take a grip of midfield, and playing down the slope they were able to find the willing Boyle with constant regularity. Sandwiched in between was a free from Hanlon. But from nothing, the Gaels were then ahead. John McGrath’s precision ball in picked out Hanlon, who beat two Towers defenders to collect, before squeezing his shot past Brendan McGarvey. Within a minute Towers hit back with a goal of their own however. 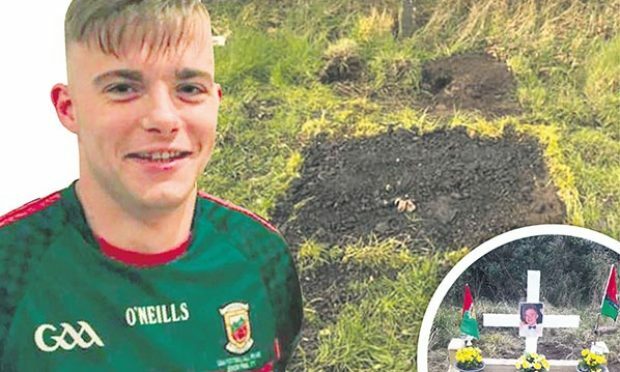 When a Gaels’ attack broke down, Hill countered before picking out the unmarked Boyle with a sublime ball, and he coolly beat Padraig McGovern. The Gaels, though, were slowly but surely gaining the ascendancy. Hanlon popped over a couple of scores and Adam Askin produced a nice point off the outside of his right boot. There was still just a point between the sides two minutes before the break, as Billy Manley fired over for Towers. But the Gaels would finish the half strongly to lead by 1-8 to 1-5 at half-time. Although O’Donoghue’s free cancelled out Hanlon’s early second half strike, the Gaels were soon back into their groove. Hanlon knocked over a brace of frees and one from play, with Eoin Mageean also getting in on the act. The lead was up to seven points when Mullin beat McGovern to the punch, to turn Hanlon’s ball in into the Towers net for the Gaels’ second goal of the afternoon. The visitors now led 2-13 to 1-6 with 12 minutes left to play. Two minutes later the Gaels had goal number three. A quickly taken free by Gary Magee found the Towers defence exposed, and Matt Moynahan fed Hanlon to find the net. David O’Donnell pointed and it now seemed a case of just how many the Gaels might help themselves to in the closing stages. Danny Fox pointed for Towers to end their 20-minute scoreless period, but Hanlon then unceremoniously put his foot through the ball from close range for goal number four for the Gaels, and to complete his hat-trick. After seeing his teammates almost try and walk the ball into the Towers net, Hanlon just buried it in uncompromising fashion when it found its way to him. Credit to Towers, they kept going and were rewarded late on when Boyle claimed his side’s second goal. The hard work in the build up, though, was all done by Hill, whose run and neat one-two created the opening. That sandwiched two Boyle frees which took the home side to a respectable final tally. The Gaels, however, will be more than pleased with their opening run out. Not too many cobwebs on evidence in Mitcham. 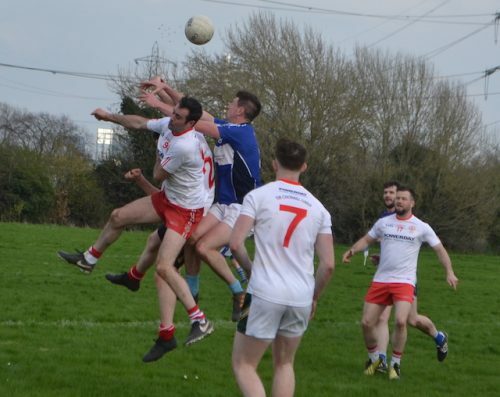 Tir Chonaill Gaels: Brendan McGarvey; Michael McWilliams, Shaun Burke, Liam Monaghan, Eamonn McConville, Gary Magee, Matt Moynaham; Brian Mullin (1-0), Brendan Friel; Adam Askin (0-1), Adrian Hanlon (3-10, 5f), David O’Donnell (0-1); John McGrath (0-1f), Kevin Rafferty, Eoin Mageean (0-1), Subs: Ryan Kearney for Monaghan, Kieran Clarke for Rafferty, Conor McCarthy for McGrath, Peter Williams for Askin, Clive Mills for Mullin, Askin for Hanlon. Round Towers: Padraig McGovern; Conor O’Brien, Pat Daly, Phelim Farrelly; Seamus Dwyer, Bryan Breslin, Dave Sheridan; Liam Feerick, Paul O’Donoghue (0-1f); Tomas Hill, Conal Scott, Ronan Boyle (2-6, 3f); Kenny Rigney, Liam Carney, Billy Manley (0-1). Subs: Thomas Hanley for Manley, Liam Ratigan for O’Brien, Mark Carter for Sheridan, Danny Fox (0-1) for Scott, Killian Egan for Farrelly, Darren Shorlett for Hill.